Helicopter evacuations from Lebanon of U.S. citizens continued Tuesday, a few dozen at a time, while a chartered Greek cruise ship headed toward Beirut to pick up more. Israel was allowing evacuation ships through its blockade of the country. France and Italy moved hundreds of nationals and other Europeans out Monday on a Greek cruise liner. 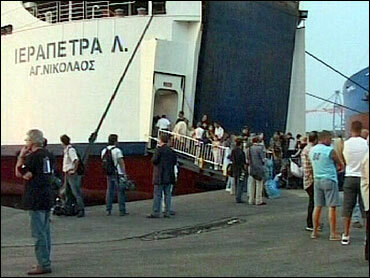 An Italian ship left earlier with 350 people and other governments were organizing pullouts by land to Syria. The Hual Transporter, chartered by Sweden, was in the port Tuesday afternoon loading up to 1,000 Scandinavians and other Europeans. Some 150 American students were in line waiting to take that ship, U.S. officials said. As many as 15,000 Americans may want to be evacuated. But the U.S.-chartered Orient Queen, which can only carry 750 passengers, still had not arrived a few hours before nightfall, and moving hundreds of Americans through Beirut at night would not be good. "In a situation like this, we have to go out and rent vessels," U.S. Undersecretary of State Nicholas Burns said on CBS News' The Early Show. "The problem we have in Lebanon is we are not sure how many of these Americans will come out. We have asked Americans to register with our embassy online; 15,000 have registered, just 3,000 over the last couple of days." A new round of Hezbollah rockets pounded northern Israel Tuesday afternoon, killing one Israeli in Nahariya. An earlier rocket hit the Haifa train station, reports CBS News correspondent Robert Berger (audio) — the very same place where a rocket hit two days ago and killed eight people. In an exclusive interview with CBS News a top Syrian official denied his country was giving weapons to Hezbollah, and offered to help resolve the crisis. Israel expects to wrap up its offensive against Hezbollah "in a matter of weeks," a top general said Tuesday — but not until it has accomplished its objectives, said the prime minister. Foreign Minister Tzipi Livni said Israel would be ready to call a cease-fire with Hezbollah if its captured soldiers are returned, the Lebanese army deploys along the countries' shared border and the future disarmament of the militia can be guaranteed. "The responsibility we in Washington have to American citizens overseas in a situation like this is to help them. That's what we doing," Burns told Early Show co-anchor Hannah Storm. But the U.S. is falling down on the job, evacuee Renee Codsi said on CBS News' The Early Show. "They were not getting enough communication out to those who need help. They need a lot more communication and a lot more help to them," Codsi, a Lebanese-American, said. The U.S. Embassy in Beirut tried to calm impatient Americans, saying everyone who wanted to will get out, just not all at once. U.S Ambassador Jeffrey D. Feltman said more than 300 will leave Lebanon Tuesday — but not all via U.S. transportation — and 1,000 more on Wednesday. But the government help isn't free. "Yes, we are the only ones being charged to evacuate," said Codsi. "So I want to send the bill to the Israeli government and have them pay for it." Burns blamed other Arab countries for creating the crisis. "There's no question Syria and Iran are arming Hezbollah — they have been doing so for many years," Burns said. As a result, Burns said, Hezbollah is now able to reach Israeli cities that haven't seen attacks in 35 years. "That's due to Iran and Syria providing that missile technology to Hezbollah," Burns said. Syrian Vice Foreign Minister Fayssal Mekdad told CBS News correspondent Richard Roth the Syrian government is not delivering weapons to Hezbollah, and has not done so since the Syrian army withdrew from Lebanon more than a year ago. Asked if Syria was still giving Hezbollah money and logistical support, Mekdad said, "We don't provide anything." This is the Syrian government's first official denial since the crisis began. Mekdad did say Syria provides "support" to Hezbollah, characterized as political and ideological. And in that context, he asserted "We can influence things" in Lebanon. He offered no new formula for ending the crisis. He stuck to the position that a cease-fire has to be the first step, and he dismissed the idea of a release of the captured Israeli soldiers that was not accompanied by a release of Lebanese prisoners held by Israel. According to the vice foreign minister, the U.S. has made no direct approaches to Syria for help, and he expressed some surprise. "We can help," he said, but don't give them orders. It's clearly a signal Syria wants to get involved diplomatically, though there's no indication it has a new formula to end the crisis. Meanwhile, Israeli Prime Minister Ehud Olmert said that Israel will press on with its weeklong Lebanon offensive until captured soldiers are released and Israeli citizens are safe from attacks. "Israel will continue to combat Hezbollah and will continue to strike targets of the group," Olmert said in a written statement. Deputy Chief of General Staff Major General Moshe Kaplinsky also told Army Radio the air strikes should be sufficient. "At this stage we do not think we have to activate massive ground forces into Lebanon but if we have to do this, we will. We are not ruling it out," Kaplinsky said. Israel struck a Lebanese army base outside Beirut and flattened a house near the border Tuesday, killing at least 16 people in a new wave of bombings. The air strikes are concentrated in the valley in the center of the country and in the south along Lebanon's border with Israel. The Israelis may be aiming for Hezbollah targets, reports CBS News correspondent Elizabeth Palmer in Beirut, but most of the casualties are those who live in Shia Muslim areas where Hezbollah is headquartered and has support. A top Israeli defense analyst tells CBS News chief foreign correspondent Lara Logan that the Israelis have not hit all of the strategic targets on their list. All they are looking for now is targets of opportunity, acting on intelligence. "The one thing they haven't managed to take out is Hezbollah's leadership. That's significant," says Logan. "Here in the Middle East, as long as Hezbollah's leaders stand, they will be seen as heroes for standing up to the most powerful army in the Middle East." Maj. Gen. Udi Adam, the head of the Israeli army's northern command, warned that the campaign against Hezbelloh wasn't completed. "It could take days, it could take weeks," he told Israeli Army Radio. "I think that we should assume that it will take a few more weeks." After a week of fighting, Livni said the time for diplomacy was at hand, though she added that Israel's military operations would not end until its goals are reached. "The idea is not to reach a ceasefire," Livni said, because that would leave Hezbollah in place to trigger future crises. Livni's remarks after a meeting with a U.N. delegation to the region were the first indication that the sides were making efforts to end violence that began with a Hezbollah attack on an Israeli border patrol. "We are beginning a diplomatic process alongside the military operation that will continue," she said. "The diplomatic process is not meant to shorten the window of time of the army's operation but rather is meant to be an extension of it and to prevent a need for future military operations."